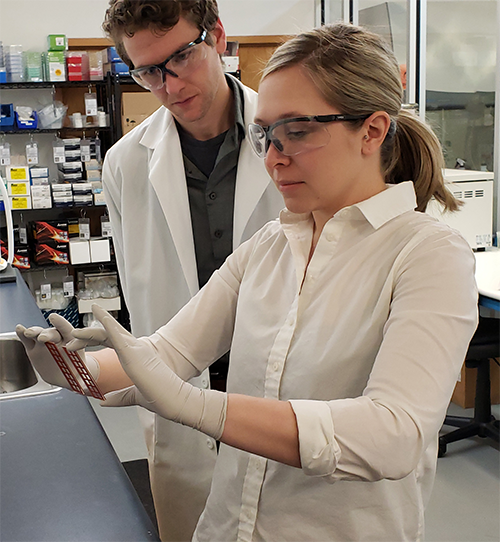 The FluChip-8G Influenza A+B Assay is a high-information content molecular assay for the identification of influenza A and B viruses. The multiplexed system capitalizes on proprietary universal amplification technology, high information content DNA microarrays, and powerful machine learning algorithms for automated data analysis to identify influenza viruses in human clinical samples through an intuitive, easy to use interface. 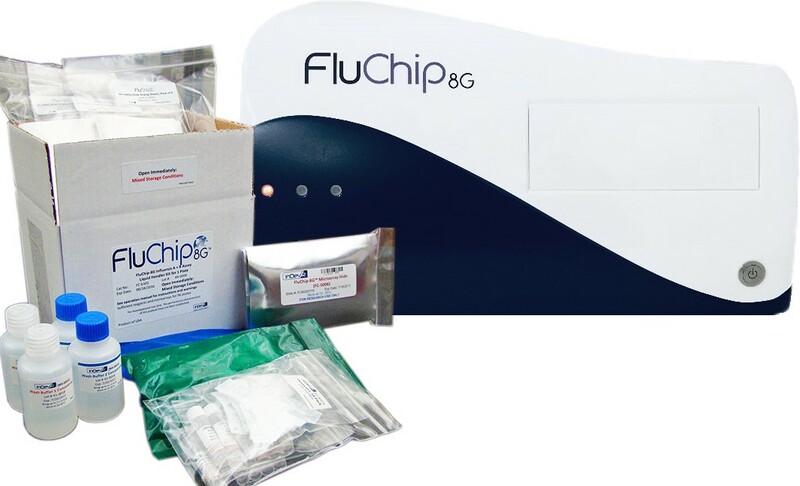 With cost-effective same day turnaround time, positive identification of influenza subtypes, and automated interpretation that eliminates the need for expert-driven analysis of complex data, the FluChip-8G assay is poised to enhance influenza surveillance and pandemic preparedness. FluChip-8G blends many of the benefits of sequencing information with the ease of use of RT-PCR and the simplicity of data interpretation of rapid immunoassays. InDevR’s FluChip-8G Influenza A+B Assay represents a progressive shift away from the ‘single bit’ information offered by typical real-time RT-PCR-based molecular assays by providing a highly multiplexed, high information content molecular assay with no end user data analysis requirements. Unlike next generation sequencing technologies that require difficult and time-consuming up-front sample and library preparation in addition to significant bioinformatics expertise to assemble and analyze the resulting sequence data, the FluChip-8G assay requires only the same easy up-front nucleic acid extraction and RT-PCR amplification as standard real-time RT-PCR assays. The heart of the FluChip-8G Influenza A+B assay is a high information content microarray. Capture sequences designed to detect hundreds of small bits of multiple gene segments of the influenza virus genome are printed on the array and serve to capture the RT-PCR amplified influenza RNA during the hybridization step. After hybridization and washing, the resulting microarray is fluorescently imaged and analyzed by a sophisticated machine learning algorithm trained to identify the molecular fingerprint of specific influenza virus groups. The end user is provided with the results in a simple report, with no need for expertise in data mining or interpretation. 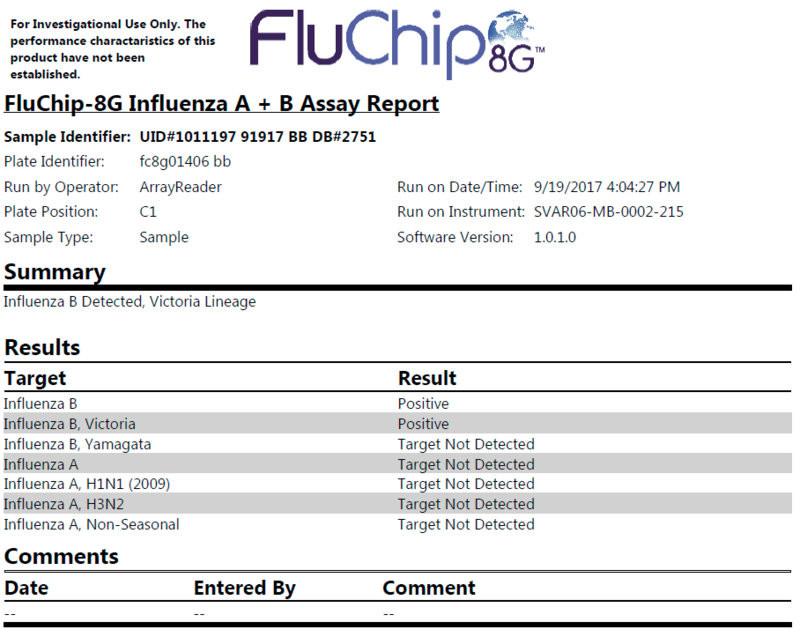 In a single test, FluChip-8G provides the end user with far more information than a singleplex real-time RT-PCR assay, including influenza type, influenza A subtype, influenza B lineage, and positive identification of a wide range of influenza A viruses other than the typical circulating annual strains (“non-seasonal” influenza A). A single user can process up to 48 assays at a single time in a single workday. The FluChip-8G system is in development and is currently for research use only. The FluChip-8G Influenza A+B Assay software consists of an intuitive user interface on the front end, and seamless control of the accompanying fluorescence imaging system combined with a powerful microarray data analysis algorithm behind the scenes. Either manually or using a barcode scanner, the user first enters names and chooses sample types for each sample to be analyzed. The user then clicks to scan the microarray, and waits a few minutes until the scan is complete and the software automatically identifies the location of the spots on each array, analyzes the fluorescence intensities of all controls and microarray capture sequences, and displays the result obtained for each sample analyzed in the form of a straightforward printable PDF report. Importantly, the software also produces an audit trail of important software events and allows electronic signatures to enable adherence to 21 CFR part 11 and Annex 11.